Paul is out-of-contact Weds. daytime, so he's updating this now (Tues. 2:30pm) to confirm that, as things stand, this event is going ahead as advertised. To check nearer the start-time, ring Jon on 077 7598 2908. An intimate evening with Jonathan Klein. 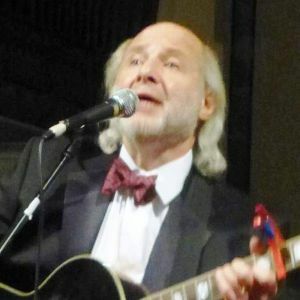 Covering a diversity of topics, he sings a mixture of his own whimsical and idiosyncratic material, along with a few covers, mostly from the '60s and '70s, all distinctively accompanied on guitar. Though based in Southampton (where he's a lecturer), he has regular connections with Lymington (hence his being known to Jon Ellis, Focsle Music's co-Organizer), attending Lymington Folk & Blues Club, and running a monthly afternoon singaround at Lane's Bar. Two albums of recent songs, Running for Love (2016) and Sleeping with the Saints (2017), are available on Spotify, iTunes, and other websites. Two 30-minute sets from him, plus support acts from regulars, preceded by a brief singaround. Free entry, with raffle and Pass-the-Hat (suggested contribution £5pp) for the main guest.